The Winter Olympics are upon us! It’s the time of year to get inspired by the world’s most dedicated athletes. Athletes that spend their lives preparing and practicing to be the best. They do everything they can to get even the slightest edge in strength, endurance, agility, balance and speed. With that in mind, we put together a list of the top Winter Olympics inspired exercises and the sports that they are best suited for. If you are competing in a sport with a lot of impact on the body, you should be training for eccentric strength. Eccentric strength absorbs force. When you lower yourself into a squat, you are using eccentric strength. The constant compression of athletes’ legs in Ski Jumping, Snowboarding and Alpine Skiing requires a lot of this kind of strength. Check out these three exercises that can help you build eccentric strength. Split Squats – Stand with a dumbbell in each hand. Position yourself in a staggered stance with your rear foot elevated and front foot forward. Begin by flexing your knee and hip to lower yourself down. Lower yourself down slowly, hold for a second then rise back up. Repeat with opposite leg. Leg Extensions – Find a leg extension machine and choose your weight. Sit on the bench with your legs under the pads. Hold onto the side bars. While exhaling, extend your legs all the way out. Hold for a second and return to the starting position. Calf Raises – Stand on a platform on your tiptoes. Hold the position for a moment then lower your heels below the platform. Try to get a deep stretch in your calf muscles. Return to starting position slowly. Core strength is essential for almost every sport, but it’s particularly crucial for hockey, the biathlon and curling. Here are our top three core-strengthening exercises that can help get you into Olympics shape. Box Jump – Stand with your feet shoulder-width apart a short distance from the box you are about to jump on. Drop into a quarter squat and explode upward with the jump. Swing your hands up for momentum while driving your feet through the floor to make the jump. Try to land softly on the balls of your feet. Body Saw – Get in plank position. While squeezing your glutes and keeping your core tight, push your body backward with your forearms as far as you can. Pull your body back to the plank position. Oblique Twists with Medicine Ball – Sit on the floor with your knees bent. Keep your feet off the floor to make the exercise more difficult. Contract your abs while sitting at a 45-degree angle. Hold the medicine ball in front of you. While contracting your abs twist your body and touch the medicine ball to the ground beside you. Bring the medicine ball slowly back to center and repeat on the other side. Fatigue is the great equalizer. When a great athlete is tired, often their performance is not great. Endurance is the key to maintaining intensity throughout your competition. 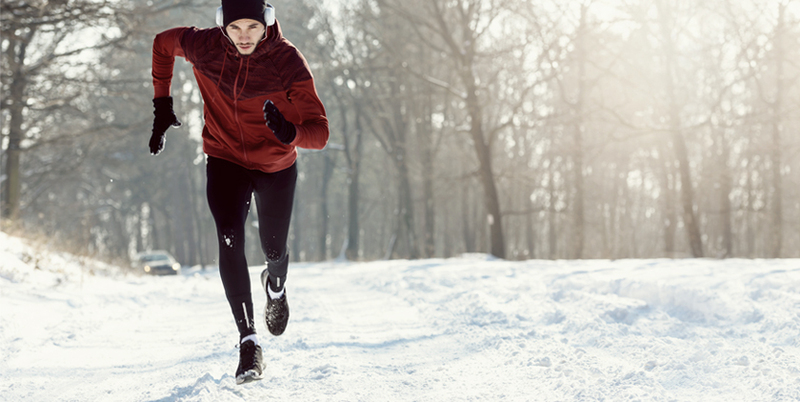 So, whether you are Cross Country Skiing, Speed Skating, taking on the luge or just about anything else that requires energy, use these exercises to train for endurance. Bicep Curls – While sitting on a bench with your feet firmly on the floor, place the back of your left upper arm on the inside of your thigh. Keep your arm on your thigh throughout. Put your right hand on the right knee for stability. Do your curls on the left side, then repeat on the right side. Stiff Legged Deadlift – Stand with your legs spaced shoulder-width apart. Bend your knees slightly. While keeping your knees stationary, lower the barbell to the ground by bending at the waist. Be sure to keep your back straight. Hop Pushups – Begin in a push-up position with your hands directly under your shoulders. Lower yourself down to the bottom of the push-up position, with your chest hovering right above the ground but not touching it. Press yourself away from the ground with as much speed and power as possible. Your goal is to not only come all the way up in your push-up, but momentarily leave the ground with your arms extended. It looks like you are doing a “hop” with your upper body. Stay tuned for Winter Olympics Inspired Exercises: Part 2. We will explain the top exercises for Leg Strength and Balance as it applies to Bobsleigh, Nordic Combined, Short Track Speed Skating, Figure Skating, Freestyle Skiing and Skeleton.